What is the difference between HTML and CSV formats of Time Report? 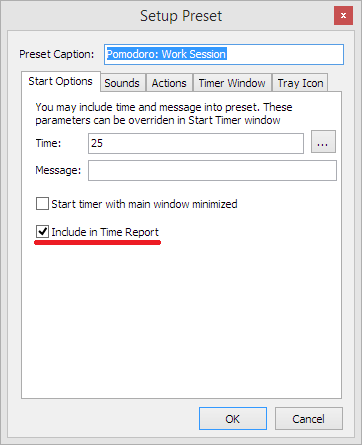 How to enable or disable Time Report? 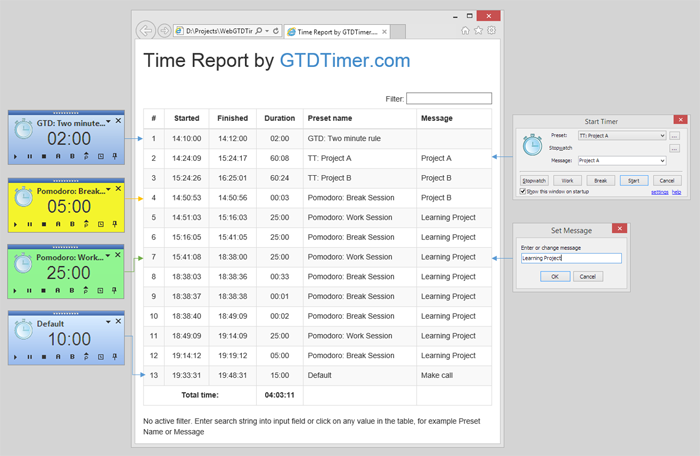 Time Report is a feature of Ultimate edition of GTD Timer. It allows to track runs of selected or all presets and save data in CSV and HTML formats. While CSV format is intended to use with spreadsheet software, HTML file can be opened and viewed in browser. 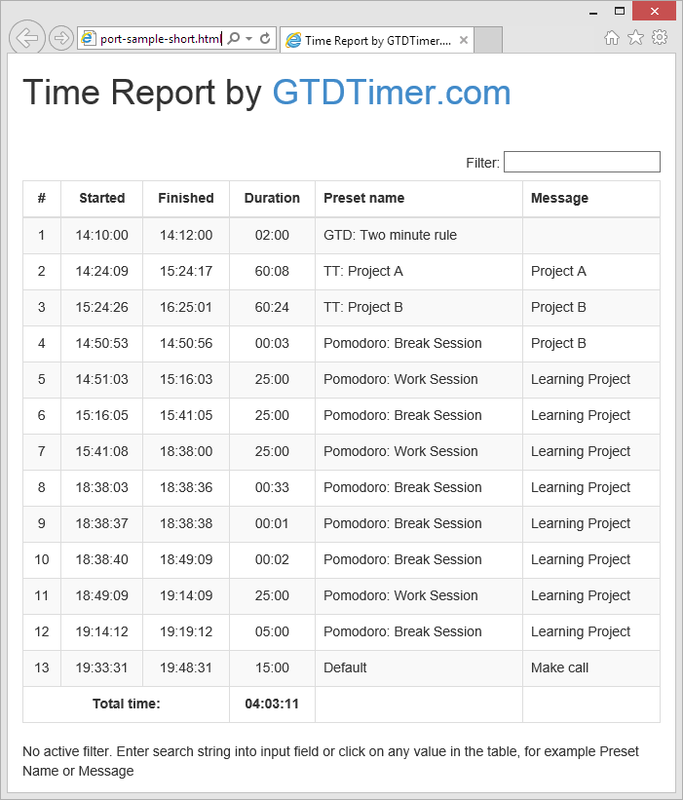 GTD Timer creates Time Reports on daily basis, each file gets unique name formed from current date. All preset runs saved to Time Report automatically. When timer is paused, this time is not counted. Message: message that is entered when preset started or set when it was running. In the picture below Time Report shown in HTML format. Time Report in HTML format provides live filtering feature: input filter string into input field or click on any value to filter same values. GTD Timer allows to customize HTML template. 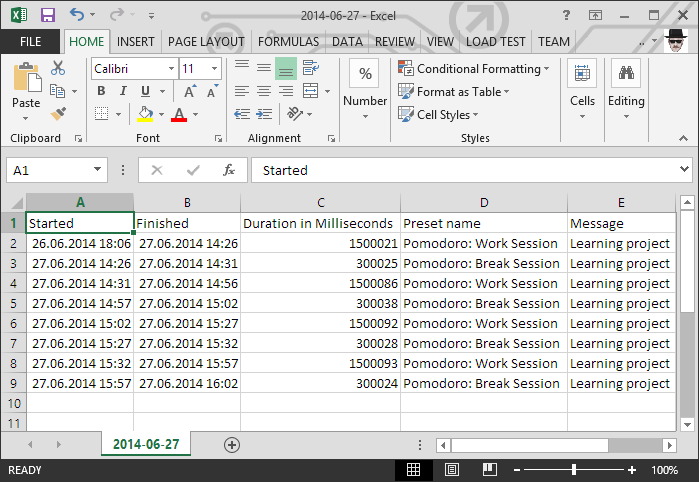 To customize template, edit TimeReportTemplate.html file in GTD Timer binary folder. 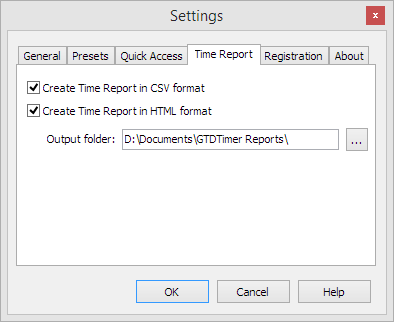 Time Report is enabled by default for both formats: CSV and HTML. 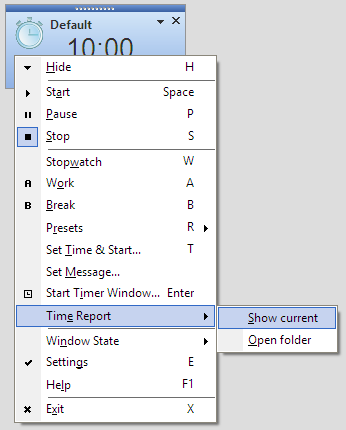 To disable or re-enable Time Report, use corresponding tab in Settings window. Also you may change folder to store reports (by default reports are stored to folder GTDTimer Reports inside My Documents folder). Also you may enable/disable Time Report on preset level, open preset settings and use option Include in Time Report.